With almost all of our Provence tours starting or ending in Avignon, this ancient city is a great place to start a tour once you figure out how you will get there. In the following article, we will cover the different options you have for arriving in or departing from this city. Walking through the city’s narrow cobbled streets, every turn of the corner reveals an elaborately decorated chapel, church, or convent. 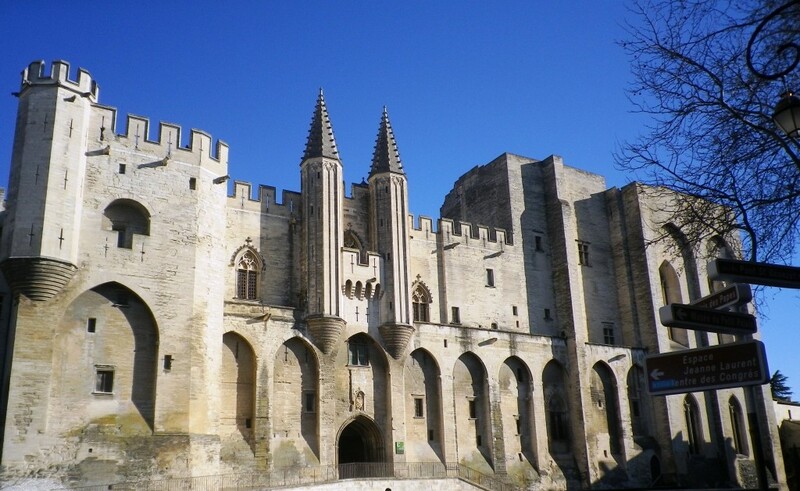 Most date from the 14th century, when Avignon became the center of Christendom, and the Palais des Papes, which punctuates the skyline with awe-inspiring ornate spires, was home to a series of popes. Located on the left bank of the Rhône River, Avignon’s setting is as colorful as its history — it appears to have been taken straight from a Van Gogh painting. Only 25 km east is one of France’s great Roman treasures and a UNESCO World Heritage Site, the Pont du Gard. One can only stare in awe at this marvelous ancient feat of art and engineering built over 2,000 years ago. In the center of the city, you’ll find quiet streets immersed in golden light, secluded courtyards, secret gardens, cozy pavement cafes, and fantastic restaurants that make Avignon the perfect place for a romantic weekend away. Although subject to the infamous Mistral wind, Avignon’s climate is otherwise pleasant. Provence’s warm summers make Avignon a great destination for al fresco activities. Visit in July to see the annual Avignon Festival that attracts aspiring performers and art aficionados. So, now that you’re curious about this historical gem in the beautiful Provençal countryside, how will you get there? If you are coming to Avignon from within Europe, particularly the UK, flying directly into the Avignon Airport (AVN) is a good option as you’ll find regular flights from Southampton, Birmingham and London City via FlyBe. However, if you are coming from somewhere outside of Europe, it is better to fly into a larger international airport first and connect to Avignon. The Local line 22 from Avignon (airport) to Avignon TGV (the train station) is the way to get into town. It is important to be aware that while flying directly to Avignon saves you a train transfer, the airport is located about 10 km outside of the city, and there are infrequent buses to the city center. Otherwise, it is necessary to take a taxi from the airport that can cost you upwards of 25 euros for a 15-minute ride. However, this fare could change drastically depending on the time of day or season, as could availability of taxis. If you choose to fly into Paris, or if you’re starting your holiday with a visit to the City of Light, you will find direct trains to Avignon from Paris Charles De Gaulle Airport TGV station or the Gare de Lyon. Paris’s major train station, Gare de Lyon, is centrally located and easily accessible via Public Transportation or taxi. If you plan to fly into Paris and depart for Avignon the same day, you have the added convenience of heading directly to Avignon from the Paris Charles De Gaulle Airport TGV station. The Paris-Avignon train runs on TGV France’s high-speed rail, operated by SNCF, making the duration of the trip around 3 hours. Because it is a regular line with trains running all day long, you’ll be able to choose from a number of departures. With advanced planning, you can get a train ticket from 45 euros at Oui-SNCF. Be warned that many pre-purchased tickets are nonrefundable, and make sure you select the correct train station when booking. Please note that you can easily purchase your ticket at the station as well, except during summer’s peak travel season. Flying into Lyon’s international airport and taking a train to Avignon is another good option. From Lyon, there are numerous direct trains to Avignon every day with travel times of just over an hour. Similar to Paris, Lyon also has multiple train stations (Lyon Part Dieu, Lyon Perrache, and the airport station) where you can catch a train to Avignon, so please make sure you pay attention to your station. If you plan on flying into Lyon and continuing straight to Avignon, the Lyon Saint-Exupéry TGV- Aéroport station is connected to the airport and for around 40 euros you will arrive in Avignon in about 1 hour. With the development of the new train station near the airport, Gare de Vitrolles, and an easy shuttle from airport terminals to the station, flying into Marseille’s International airport and transferring to Avignon is now easier than ever. From the Aéroport Marseille-Provence – Vitrolles train station you will find many direct TGV trains to Avignon each day. These trains take around an hour and a half to get to Avignon, at a cost of about 20 euros. *The train cost is estimated based on several weeks’ advanced booking from the date of this publication, but please note that many tickets purchased in advanced are nonrefundable. Avignon has two train stations, so please make note of your arrival station. The Avignon TGV station is located to the southwest of the city center, about 4 km from the aptly-named Avignon Centre station in downtown Avignon. Most trains from Paris and Lyon arrive at the TGV station, though it is possible to find direct trains to Avignon Centre. It’s very easy to connect from the TGV station to Avignon Centre on a quick 5-minute train ride. Trains depart every 30 minutes from 6:57 am to 11:27 pm, and you can purchase tickets at Avignon TGV station for less than 2 EUR. You may also take a 10-minute taxi ride which will cost you approximately 10 – 12 euros (daytime rate) directly to your hotel. Avignon is a medieval walled city, and finding a parking spot – let alone driving! – inside the walls is difficult. (Walking or cycling inside the walls, on the other hand, is easy!) However, if you have a car in Europe or are renting one for a vacation, there are a number of places you can safely leave it while you’re off cycling through Provence. The Avignon Tourism Office created a Google map showing free parking (in orange) and paid parking (in pink). Avoid the blue parking lots unless you’re driving a bus! For more in-depth information including prices, we recommend checking Parkopedia.